Melbourne went in favourites to beat Essendon yesterday afternoon and demonstrated in the best way possible that they can not be trusted with such a tag. Sadly this photo is still relevant. by the least stable (off the field at least) team in the league is beyond comprehension. 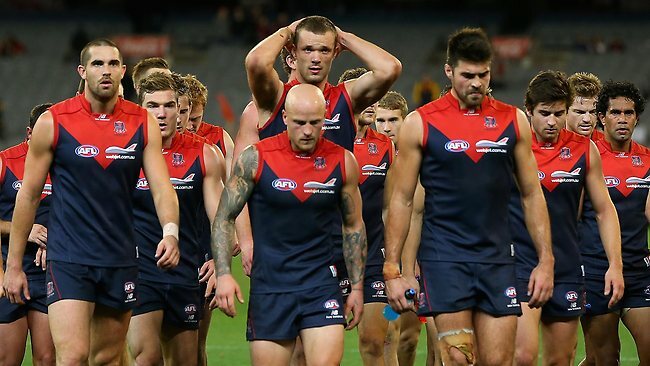 Kicking has long been an issue for the Demons but Roos doesn’t want to see it. Instead we get the line about a young squad. It’s not 2008, I’m not interested in that or the honourable loss talk anymore. Not to suggest that I’m the world’s greatest predictor of sporting results – but I saw this coming. From the second Essendon got walloped by St. Kilda last Sunday afternoon the writing was on the wall . I wanted to believe that after a lifetime of frustrations I’d be proven wrong (so I tipped us). Supporting Melbourne is, at the best of times a bi-polar experience. Promising wins and devastating losses are nothing new, and certainly nothing new in 2015 (Geelong in Geelong / GWS in Canberra). So why does this bother me? These are the games that we need to win if we are going to be taken seriously heading in to 2016. Last weekend there was talk of Essendon not winning another game in 2015. If they were playing anyone else this weekend they would have lost and probably been comprehensively thumped. Of course Melbourne lost, it was the most Melbourne thing they could possibly do. Why bother having the great hope that things are going to change with the flick of a switch? False dawns. Two words that perfectly sum up every Melbourne supporter experience I’ve ever come across. What is Roos doing if he can’t see that our kicking needs work? I know the weather was bad, but Essendon were able to negotiate it and we should have been too. Where was the fluidity we showed against the Gold Coast and Richmond when everything was fantastic? There’s no denying we’ve got a great crop of young talent, but that’s little to smile about when we drop points like we did yesterday. Our time has been coming since the start of the 1970s and the reward we’ve got is a couple of thumping Grand Final losses for our troubles. Wonderful. What is the club trying to achieve this season? I usually try to steer clear of the doom and gloom talk but yesterday really puts things in perspective. We aren’t good. Worse than that, we aren’t reliable and we aren’t going to be for a long time. A few blokes have 30 touches for a few games and they think they’ve got the world figured out? We have some strong multiple goalkickers and we think they’re going to kick five every week? We have a strong run so we don’t need to worry about giving the ball to a man who is under pressure and only going to turn it over? The ineptitude that has been bred in the Melbourne Football Club truly knows no bounds. You could put Nat Fyfe in our team next week and he’d forget how to put his shoes in. The culture in the club is unacceptable and worst than that it’s offering success in nothing more than mediocrity. The culture at the club is all wrong. We’re being asked to expect miracles when for any other club it would take nothing more than a consistent effort. We’re too busy ripping blokes on the field rather than ripping the structure we have off it. That’s how we’ve come to this. A belief that we’re in a better position than we are. It’s not difficult for Roos to fix but I fear he has no interest in delivering the home truths that are associated with the task. Our communication is awful. On and off the field there is little positive talk unless things are going perfectly. Everything needs an excuse, everything is going to be better soon. Forgive me, but I’ve heard this roughly 743 times in my life. For the first time in the Paul Roos era I’m concerned that we’re letting the world continue to pass us by. He’s said it himself “Our best footy is streets ahead of last year, our worst is just as bad”. Yesterday was worse than bad. Thanks Melbourne. This entry was posted in Published on xavierplayer.com, Written and tagged Melbourne Demons. Bookmark the permalink.